MicroRNAs (miRNAs) are small noncoding RNAs that are 22–25 nucleotides in length and control gene expression posttranscriptionally by degrading mRNAs or by translational repression. 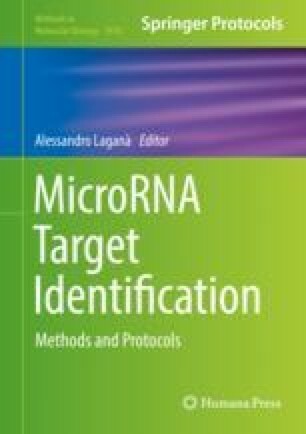 Many computational tools based on algorithms for target prediction have already been developed to find potential miRNA–target interactions. Since it is essential to confirm in silico predictions, experimental approaches have been improved to validate computationally predicted targets. One of the most widely used techniques is the luciferase assay which allows for the confirmation of specific binding between microRNA and the mRNA target using a reporter plasmid containing the 3′ UTR of the target. Through the mutagenesis of this region it is possible to provide indirect evidence of the specific microRNA–mRNA interaction demonstrated using this assay. In this chapter we review the main experimental steps of the 3′ UTR mutagenesis and the best way to apply this method to support and complete the luciferase assay procedure.